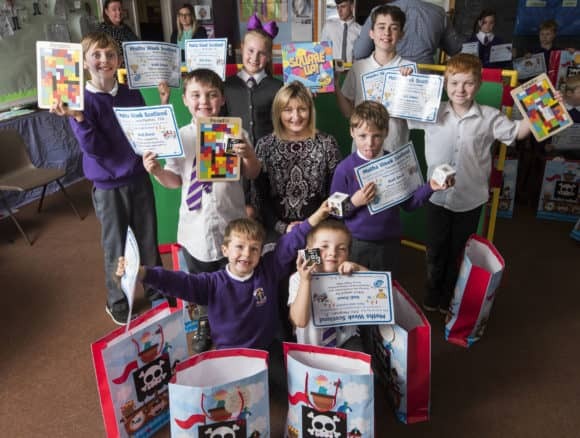 A Dundee primary school has teamed up with a firm of local accountants to help boost the image and enjoyment of maths. Jenny Law, EQ’s HR & Training Manager with pupils. EQ Chartered Accountants contributed £250 towards a host of activities and challenges which St Pius X RC Primary School pupils, including nursery children, embarked on as part of the inaugural launch of ‘Maths Week Scotland’.The Scottish Government campaign ran from 11 to 17 September 2017, with St Pius chosen as the Maths Week launch school for Dundee City Council. EQ’s contribution helped fund prizes and certificates for pupils.